Spartan Games posted their last set of pre-orders for this year. There's a whole bunch to see, so check 'em out. Following the exciting launch of Firestorm Planetfall, headlined by the excellent Battle for Proteus Prime 2 Player Battle Box, Spartan Games is pleased to announce our final release of the year. The December release includes new additions for Firestorm Planetfall, Firestorm Armada, Dystopian Legions and Dystopian Wars, so there's something for everyone this holiday season! The Dindrenzi Federation, Terran Alliance, Sorylian Collective and Relthoza join the battle in Firestorm Planetfall as we make the Core Helix for each of these major races available, giving you the perfect way to begin building your force. You may also wish to consider hiring the services of either the Ba'Kash or Hawker Industries, the latest allied forces to bring havoc to your battlefield. 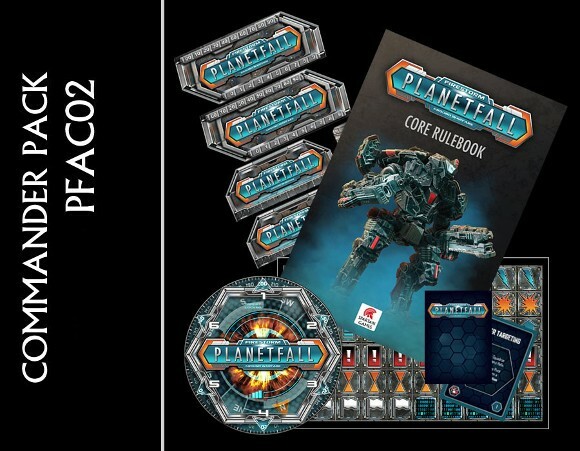 Don't miss out on the Commander Pack - a great way to pick up the rulebook, TAC cards and many other useful items for your games of Firestorm Planetfall.